If you are new to astrology then you may enjoy comparing zodiac signs. 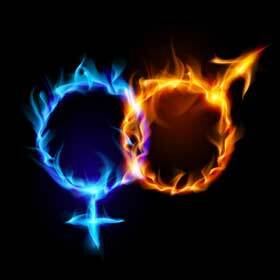 The easier way to know your general compatibility is by matching astrological elements. In astrology there are four elements being Earth, Air, Fire and Water. Each zodiac sign has there own element, it describes the core aspects of ones personality. It is easy to remember how these elements are matched. For example, fire and air are compatible. However, fire and water is not as it puts the fire out. Water and earth are compatible as they mix, but earth and fire would not be. To view compatibility on a deeper level, then you need to consider relationship astrology analysis. This compares the individual natal charts of two people (usually partners), then compares there personality traits to one another. Below are the ideal love matches for each zodiac sign.